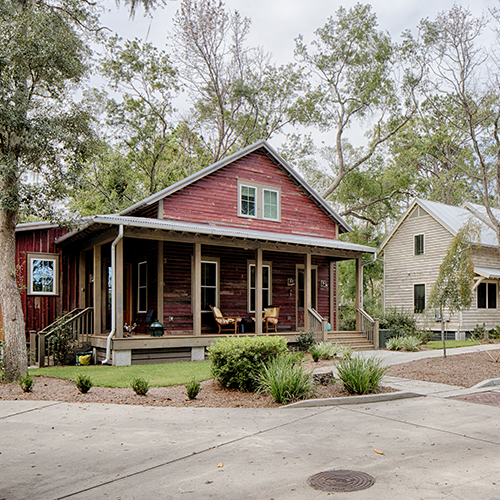 Take a stroll through Bluffton and look closely at the homes and businesses. Pay attention to how they relate to the landscape and to each other. At Pearce Scott Architects, we are preservationists as much as we are forward-thinking designers. You can see our work on display in many of the homes in our community and commercial structures. There is a dialogue between the buildings. The architecture pays homage to the historical styles of the Lowcountry of South Carolina and fuses it with relevant modern design to pay tribute to, and keep alive, the area’s rich, cultural heritage. We look at the context and the scope when we start a project. When we undertake a Bluffton project, we are acutely aware of the architectural spirit of our community and how this new project will align with that history and can merge with a contemporary aesthetic and interpretation of the Lowcountry heritage. It is this perspective that dictates our understanding that no project is too small for the application of thoughtful design. One of our community outreach projects, the Bluffton Police Substation in Old Town, is a great example of the large impact a small footprint can have on the surrounding structures and the community as a whole. A few years back, officials decided to convert the former Town Hall into a new police substation, providing better access to police services in the Old Town neighborhood, which hosts many annual events. Preserving the integrity of local architecture is evident in this storage building at the police substation on May River Road. Traditional architectural proportions, materials, and exterior fixtures gentrify an industrial building into the surrounding streetscape (or neighborhood, etc. – author to choose word). Its design is a small example of the big impact a thoughtful design can make. Pearce Scott Architects values the relationships our team nurtures within our local community. Preserving historic Old Town Bluffton is important to our staff and prioritized by working on volunteer projects to design new public structures and assist with historical structure preservation. This passion feeds our soul and our community, of which we are very proud. We are honored to be part of the architectural story of Bluffton. We get excited each and every time we contribute something beautiful to the manmade landscape of our town. Contact us to begin your project in Bluffton! At Pearce Scott Architects, our team offers a fresh approach that is grounded in decades of experience. We are intensely client-focused, and our projects integrate the contemporary elements of creativity and craftsmanship, passion and precision, and drama and detail. In our professional process, every project begins and ends with you, the client. We deliver an experience that is tailored to your unique vision and needs. From concept to completion, your priorities, passions and dreams drive everything we do, which is why our first job is to listen. We love to answer questions and invite you to learn more about our process and our commitment to client-focused practice and values. Please contact us at 843.837.5700 or come visit us in downtown historic Bluffton.